Student science writers from around the world have created a set of 52 stories from the World Conference of Science Journalists 2017, spanning most of the meeting's sessions and creating a valuable reference archive for journalists in the U.S. and abroad. 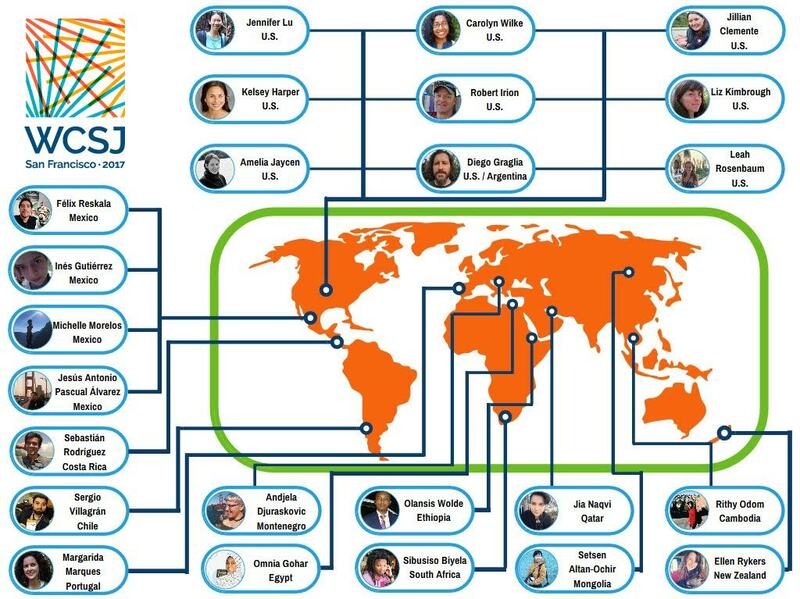 The reports, along with bios of the authors, are online at the WCSJ2017 Student Newsroom. The student journalists were part of the WCSJ Student Travel Fellowship program, organized by the National Association of Science Writers and the Council for the Advancement of Science Writing. A national panel of reviewers selected 22 students for the program from among 167 applicants. The fellows represented 13 nations: Cambodia, Chile, Costa Rica, Egypt, Ethiopia, Mexico, Mongolia, Montenegro, New Zealand, Portugal, Qatar, South Africa and the U.S. The students attended a half-day opening journalism workshop led by program co-directors Robert Irion, director emeritus of the Science Communication Program at UC Santa Cruz, and Diego Graglia, independent journalist and Silicon Valley–based Spanish-language podcaster. Irion oversaw the students' assignments, while Graglia produced and published the news site. Journalists from the U.S. and Mexico worked individually with students on their reports. Donating their time as editors were Misti Crane, Jenny Cutraro, Amber Dance, Terry Devitt, Jennie Dusheck, Lynne Friedmann, Jeff Grabmeier, Laurel Hamers, Alla Katsnelson, Kendall Powell, Czerne Reid, Erik Vance, Cori Vanchieri, Sarah Webb and Ashley Yeager, along with six members of the Mexican Network of Science Journalists (RedMPC): Javier Crúz, Manuel Lino, Oscar Miyamoto, Rodrigo Pérez Ortega, Aleida Rueda and Renata Sánchez. Generous support for the student travel fellowships was provided by the William H. Bowes Foundation, the Heising-Simons Foundation, and the American Association for the Advancement of Science.